AQUA/WATER/EAU, CYCLOPENTASILOXANE, DIMETHICONE, PHENYLPROPYLDIMETHYLSILOXYSILICATE, DIISOSTEARYL MALATE, BUTYLENE GLYCOL, SODIUM CHLORIDE, PEG/PPG-18/18 DIMETHICONE, GLYCERIN, CYCLOHEXASILOXANE, ALUMINUM/MAGNESIUM HYDROXIDE STEARATE, DIMETHICONE/PEG-10/15 CROSSPOLYMER, CELLULOSE ACETATE, DIMETHICONOL, DISODIUM COCOYL GLUTAMATE, FRAGRANCE (PARFUM), METHYLPARABEN, POTASSIUM SORBATE, SILICA DIMETHYL SILYLATE, ACRYLATES/AMMONIUM METHACRYLATE COPOLYMER, PROPYLENE GLYCOL STEARATE, TOCOPHERYL ACETATE, UREA, PROPYLPARABEN, SODIUM COCOYL GLUTAMATE, MAGNESIUM STEARATE, SACCHARIDE HYDROLYSATE, ALANINE, GLYCINE, MAGNESIUM ASPARTATE, DIPROPYLENE GLYCOL, PHENOXYETHANOL, BENZYL ALCOHOL, SODIUM CITRATE, CREATINE, POLYSILICONE-11, DEHYDROACETIC ACID, TOCOPHEROL, TITANIUM DIOXIDE (CL 77891), BISMUTH OXYCHLORIDE (CL 77163), IRON OXIDES (CL 77491, CL 77492, CL 77499). Bring tired, dull skin to life with a tinted moisturizer that instantly creates a healthy, natural-looking glow. Designed for all genders, this hydrating tint looks so natural, no one will suspect you’re wearing anything other than your own post-vacation glow. 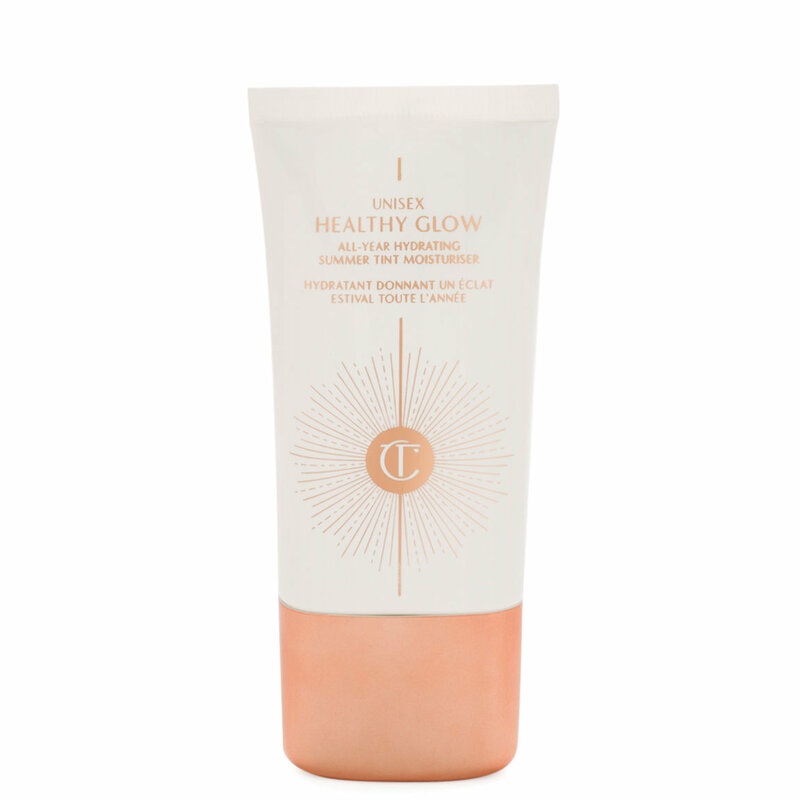 Apply Healthy Glow to your face and neck, blending out for a natural, healthy glow. Wear alone or under foundation for flawlessly dewy skin. I am 36 years old with combination skin, rosacea and hyper-pigmentation (sun spots and melasma). I am a medium to full coverage foundation girl because of these reasons. I am rarely without a full face of make-up. After Wayne Goss review of this product, I thought it could be my new holy grail. I was underwhelmed by this product especially for the price of $40. I watched an EmilyNoel83 review, and wish I watched that before I purchased. Also would be great if this stuff had sunscreen in it. I will stick to my IT cosmetics CC + bronzer if I need a little color or my pur-lisse BB cream. This stuff will be going back, sadly. I bought this like many did after Wayne Goss gave this rave reviews. It sounded perfect for no makeup days. I got in the car and flipped my visor down to look in the mirror. AWFUL! It was so dark and blotchy. I don't know that I've ever looked worse. My pores looked giant and skin looked hideous. I have great skin too. I pride myself on my skincare. I have to return this. I'm so sad it didn't work out. I too, purchased after the rave review from Wayne. I have very fair, aging skin (Age 33), neutral leaning warm undertones, loss of luminosity and visible pores. That being said, my skin is actually in pretty good condition. Not many blemishes to address, and thankfully so because I can get by with a sheer coverage most of the time, which is what this is. It does make my skin look naturally aglow, something I have been searching for since I lost my skin's natural luminosity. This is truly the best product I have found to achieve that result. It does not emphasize my pores, but it doesnt really hide them either. From any kind of distance, it looks great, but if you have enlarged pores and you are looking closely in a mirror, you are going to see them. Though no one else will be looking that close. This also gave me more color. I looked more bronzed than normal but in a good way, no orangey tones or noticeable changes where the application stopped. It truly does seem to blend with your skin color. As a pale person this absolutely blew me away! It did not oxidize over time. I checked periodically in natural and artificial light. If your neck is lighter than your face (like mine) you may want to apply to the neck as well. For me the only method of application for this product is clean fingers, no beautyblender or brush. This will ensure a smooth, even application. This cream worked very well over my Tatcha moisturizer. This product will not work miracles. It will not blur acne or provide any actual coverage. It will basically enhance already good skin. It will give you some color, and glow, and will provide a nice foundation for a natural look. I personally love it and will repurchase. Curious to see how long the tube lasts. Took two large drops to cover my entire face. This is an update to my previous post. I tried this again but under foundation. My foundation applied over it nicely and it really looked beautiful. Fast forward 2 hrs....I was a grease ball. Not only did I look like I spread bacon grease all over my face, but I looked so orange. Needless to say, I will be returning. Side note, I purchased this from the Charlotte Tilbury website because Beautylish was sold out at the time. I wish I loved it. I really do. First off, I need to comment on the smell of this product...how no one has acknowledged it yet, I do not know. It seriously smells like vomit. Seriously, VOMIT! The scent is very overwhelming and hard to get past, knowing you are spreading this all over your face. The smell does go away, for the most part, after about 5 minutes or so. As for the product itself. It went in the skin pretty nicely. I was a bit scared at first cause it seemed to be a bit dark on my fair skin but somehow toned down as I blended it in and it set. 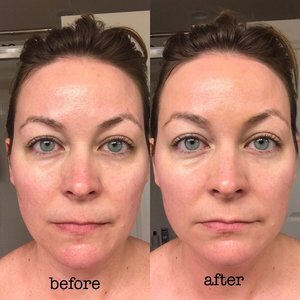 It is very glowy and it didn't seem to accentuate any pores or settle into lines, major pros! I personally don't like to be extremely glowy so I am curios to try this with a bit of bb or cc cream on top of it. I can't say that this is a life changing product and I most certainly will not be purchasing again when I run out but it is nice. If it had some blurring effects I might be sold but it doesn't. All in all, if you love glowy skin and aren't put off by horrible smells on your face products, then you may enjoy this. This is so perfect for summer. 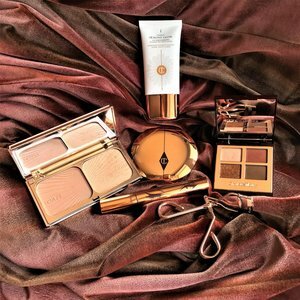 Light coverage that evens out my complexion with a bronzy glow. I added a few dots of concealer under my eyes and headed out the door to work! As many others did; I purchased this after the Wayne Goss review/Youtube video. I like it for "no makeup" days (although I sort of consider this makeup). The product does exactly what it says: it unifies the hue of the skin with a slight "glow" or warmth. While it can seem a bit "red" at first (I have very fair skin), I highly rated the product for ease of use. It really does give a "healthy glow"- as if I had been outside- except without the harmful UV rays. I have recently had a bout of cycstic acne and redness and what I really like about this product is that it kinda unifies everything- it brings my natural skin tone up to a little bit bronzed and brings down the redness of my pimples. It actually is really more like a beautiful facial tanner - well one that actually works. Zero streaking, completely unified coverage - it's really simple to use and idiot proof. Some seem to be complaining about not having sunscreen or not being a moisturizer etc. Ok.. but it doesn't claim to be any of these things. I use it after I put on my usual moisturizer and my sunscreen. Then put on lip balm, mascara and I'm done. I get compliments on my skin "glowing". That is enough for 5 stars. Particularly considering the fact that my skin is going through a rough patch right now and due to using Retin-A for the acne, I can't use foundation at all. This stuff is magic. Buy it. I love this product. Goes on smooth and easy adapts to skin tone. Gives a healthy glow with just enough color. I would love this even more if it had SPF.